Your child's toilet training develops during the first years of life when they start to become aware of the urge to urinate. Your child must still learn to hold their urine at night or wake up to the sensation of a full bladder. If your child still wets their bed beyond pre-school age and there is no medical reason to justify this, they suffer from bedwetting (enuresis). A bedwetting alarm teaches children to wake up to the sensation of a full bladder. 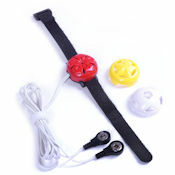 The alarm immediately sounds an alarm tone when the child loses a few drops of urine. The alarm will then be switched off and the child can finish urinating on the toilet. Through this therapy, the child learns to associate the sensation of a full bladder with having to wake up. In time your child will wake up on their own without having to depend on the alarm tone. When they remain dry for fourteen nights in a row, the bedwetting alarm is not needed anymore. Even when the bedwetting alarm has not been used and they still manages to keep dry, the training is considered successful and your child is toilet trained. Easy to use and easily fitted, the Dry Night Trainer can be worn on either the left or right wrist and attaches to your child’s ordinary underwear. The bedwetting alarm is attached to your child’s wrist. The sensor cable is then "clicked" onto their underwear on the spot where the urine will reach the cloth first. When the cloth between the two sensors becomes wet, they will react and cause the bedwetting alarm to sound off an alarm tone, waking up your child. It is important to keep your child motivated whilst using the Dry Night Trainer. You can download our ‘Progress Chart’ to track their progress and introduce a reward scheme for positive behaviour. The Dry Night Trainer uses miniature electronics - the currents being used in the sensors to measure the humidity are extremely low and therefore absolutely safe. The Dry Night Trainer also adheres to all needed medical standards.